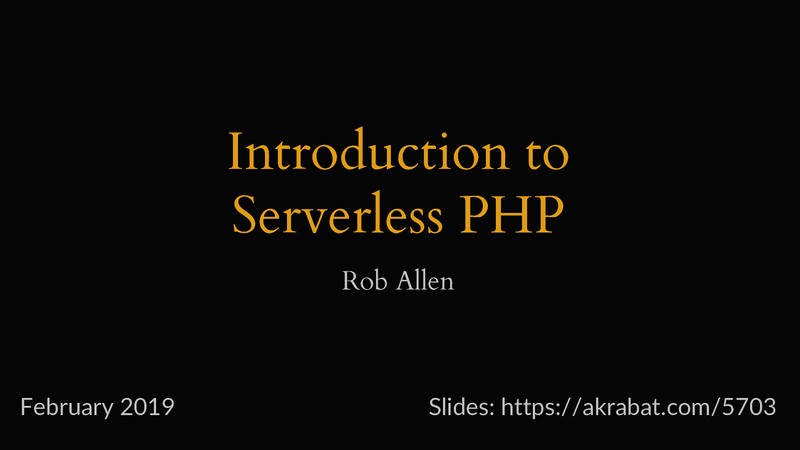 View Introduction to Serverless PHP on Notist. Starting with the basis of Serverless, you increase abstraction and simplicity of execution by trading control. The abstraction is consistent with modern technology. A journalist doesn’t have to understand a printing press, but cares about the cost of printing. We build our functions with an entry point, event parameters and a service result. Standard upload and invoke process in Whisk. Don’t use the web consoles. You can only do it the same way once. Use infra-code to ensure repeatable operations. Things change in AWS recently. PHP only works sensibly now that AWS includes Layers. We need a layer with the PHP binary and bootstrapping to float the PHP function on. Missed the resource slide, but @akrabat gave a great overview and will tweet it his slides later if you’re interested. #SunPHP19 Thanks!